Apple introduced its iMessage-based communication system Apple Business Chat to the U.S. earlier this year. The service has now is going global - and is now available in Australia, Canada, France, Germany, Hong Kong, Italy, Singapore, Japan, Switzerland, and the United Kingdom. The service is like those bot-based messaging systems, but a lot more convenient. It lets customers speak to real people, and it gives users lots of control over how much information they share with a business. To make Business Chat function, Apple works with customer service platforms, including LivePerson, Salesforce, Nuance, Genesys, InTheChat, and Zendesk. After months of testing, Google is opening its business messaging platform, Hangouts Chat, to everyone. The Slack-like service for team communication is now open to all of the company's business customers who use its G Suite services. 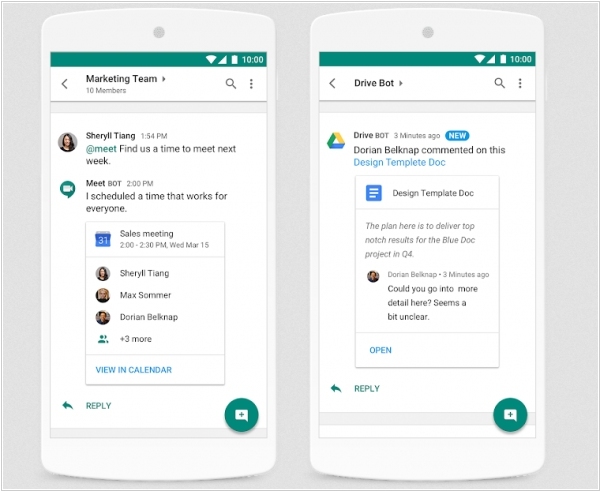 Google is a relatively late entrant to the business-messaging software game. At this point, Slack and Microsoft, with its Teams app, both have significant head-starts. But there are a few areas where Google is hoping to differentiate itself from the competition. By being directly integrated into all the Google services businesses are already using, like Drive and and Google Calendar, Hangouts Chat can streamline tasks like file sharing and scheduling meetings. For example, Google's meeting-scheduling bot will be able to automatically schedule team meetings based on each person's calendar. 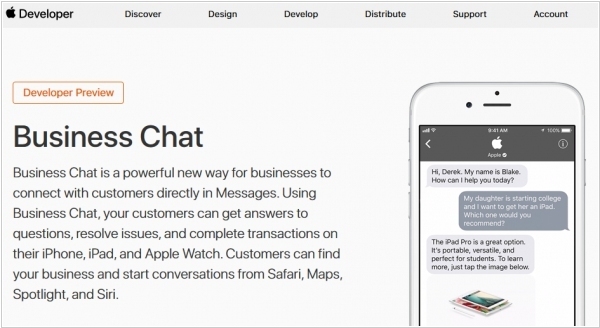 Apple debuted iOS Business Chat for its Messages application, a chat-based customer service channel for businesses. Essentially, it's a live-chat function in Apple's iMessage ecosystem that connects with the 1 billion active Apple iOS apps device users use — Apple Maps, Siri, Search and their own website and apps. Customers can also use it to pay for items through Apple Pay or schedule follow up support sessions through calendar integration. 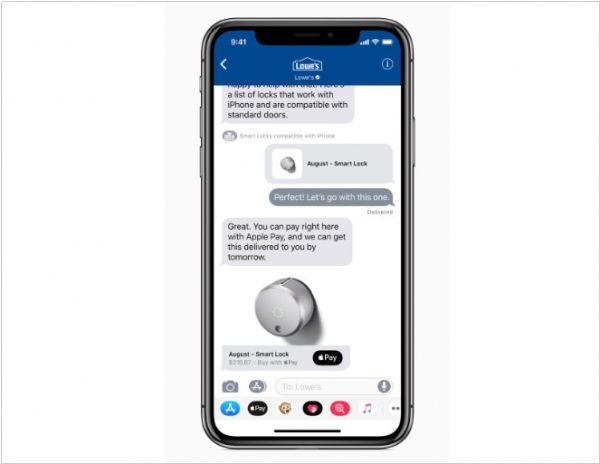 Customers will be able to from inside their iOS messenger platform connect with businesses through chat, pay for items, share photos of broken products, share videos and book flights after choosing seats. 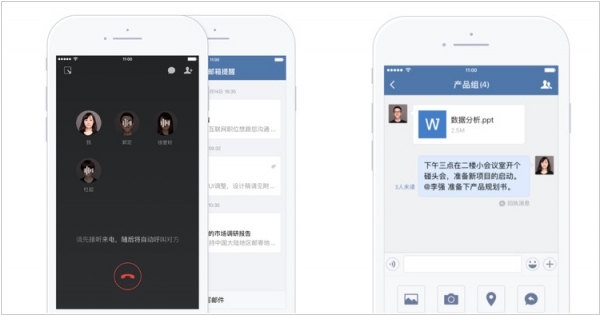 Chinese messenger WeChat launched its free office chat app, WeChat Enterprise.For now it's only available in Chinese via apps for iOS, Android, Windows, and OS X. WeChat Enterprise includes a number of features that are familiar territory to those who have used business chat apps. But it also has some welcome innovations. The service can essentially replace group email, and make quick chats between colleagues easier. It has useful add-ons like the ability for an employee to mark when they are on a break, hold group voice/text chats, and allows for companies to build in specific features like automated forms for reimbursements, vacations, and the like. Kato.im, the real time collaboration tool for business, has launched a new product - Kato Teams — a free professional chat solution offering live 1:1 and group messaging, file sharing and search capabilities. Unlike other similar free real time collaboration products, Kato has no limitation of team members, message history storage or multi-company functionality. 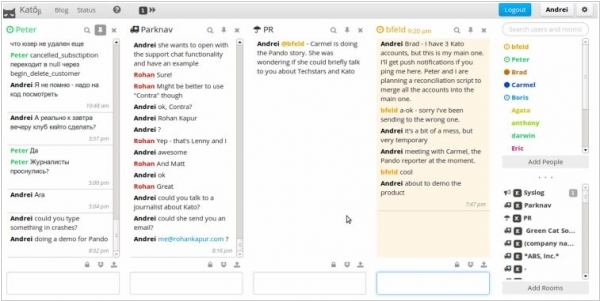 Kato Teams has a user interface that enables multiple, side-by-side conversations. From a single window, members can display conversations from one or more teams, eliminating the need to toggle between internal chat, external messaging, or multiple browsers. Extra features of Kato Teams include global search, access control, noise control, integration with dozens of third-party services, such as GitHub and ZenDesk, to aggregate notifications from multiple tools.